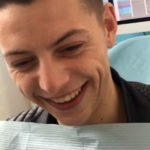 You are here:Home / News / VIDEO: Adam’s reaction after his braces were removed is priceless! We loved Adam’s reaction to seeing his new smile revealed after a period of wearing Fixed braces. Watch the video below. Are you looking to get your teeth straightened? We have a number of options for teeth straightening for both adults and children – including clear braces and Invisalign. Get in touch to arrange a consultation.